Since our origin, we are affianced in manufacturing, exporting, trading and supplying quality assured Ceramic Digital Wall Tiles. Broadly used in commercial & residential buildings to enhance the beauty of interiors, these tiles are highly appreciated among our clients who are situated across the nation. At our premises, these tiles are processed with the help of premium quality ceramic and advanced technology. Also, we provide these wall tiles in plethora of prints, colors and designs. Established in the year 2007, in Morvi (Gujarat, India), we “Capson Tiles Private Limited” are an ISO 9001: 2008 Certified entity engaged in manufacturing, exporting and supplying of Wall Tiles, Kitchen Wall Tiles, Bathroom Tiles, Digital Wall Tiles, Glazed Tiles, Chequered Tiles, Elevation Tiles, Ceramic Wall Tiles, Floor Tiles, etc. 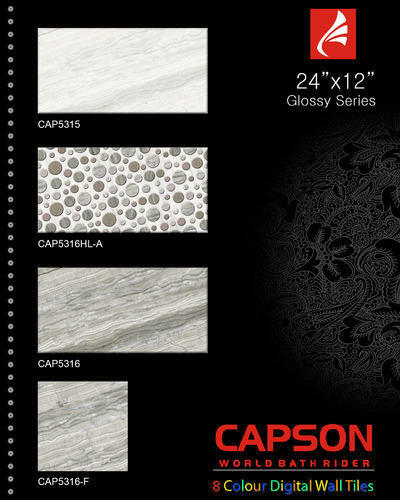 We, Capson Tiles Private Limited, are a renowned manufacturer, exporter, wholesaler and supplier of a wide range of Wall & Floor Tiles. Our range of finely designed and customized products can be used for Interior & Exterior walls and floors.We are expanding our business world-wide. We currently export in Middle East Countries, Africa, Latin America, Ireland, UK, and few countries of Europe.